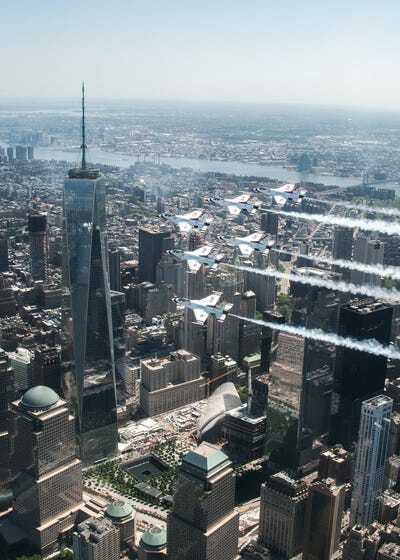 U.S. Air Force photo by Senior Airman DeAndre CurtissAmerica’s Thunderbirds. 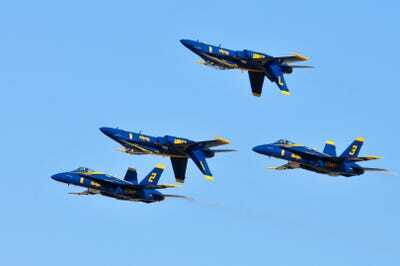 The pilots of America’s military demonstration teams, the US Navy Blue Angels and the US Air Force Thunderbirds, are the some of the world’s best, performing death-defying tricks in fighter jets. 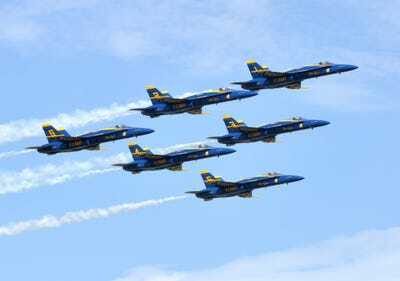 Flying F-18s and F-16s, the individual skills of each pilot is admirable, but what sets the pilots of the Blue Angels and Thunderbirds apart is their ability to work as a synchronised team. Here are 25 of our favourite action shots showing this beautiful coordination. 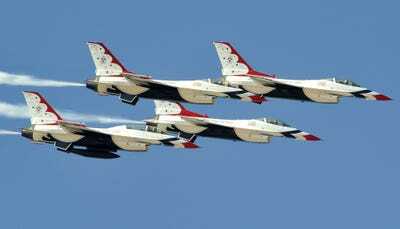 The Thunderbirds Delta Formation flies over Daytona International Speedway during a practice flight for the Daytona 500. 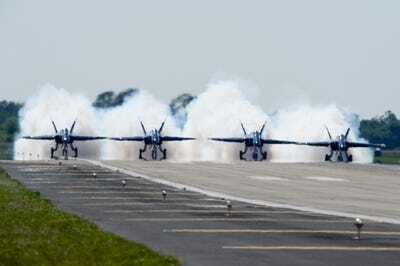 The Blue Angels demonstrate choreographed flight skills during the annual Joint Service Open House. 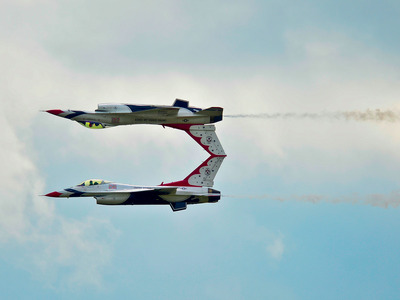 Two US Air Force Thunderbird F-16 Fighting Falcons execute a precision acrobat technique for a crowd at MacDill Air Force Base, Florida. 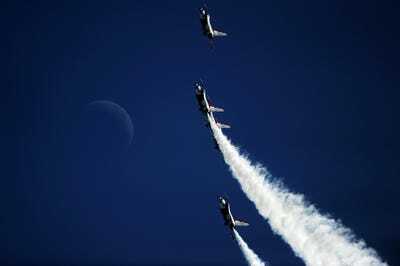 The Thunderbirds perform the Five-Card Loop during Thunder Over Solano open house at Travis Air Force Base, California. 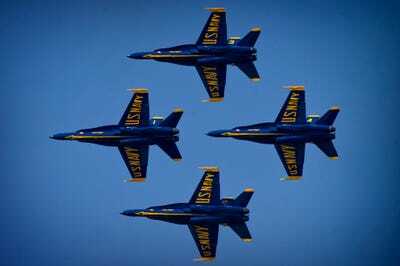 The Blue Angels fly in formation above Naval Air Station Joint Reserve Base New Orleans. 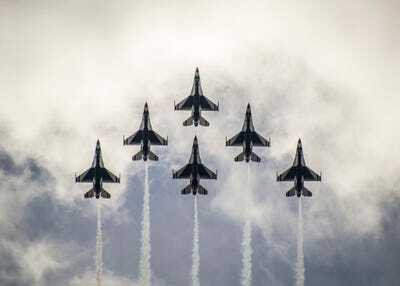 The Thunderbirds aerial demonstration team flies in formation during an open house and air show at Joint Base McGuire-Dix-Lakehurst, New Jersey. 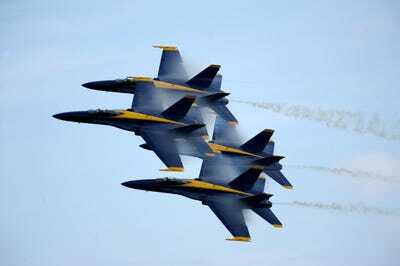 The Blue Angels perform the Diamond Low Break Cross manoeuvre at the Randolph Air Force Base Air Show during San Antonio Navy Week. 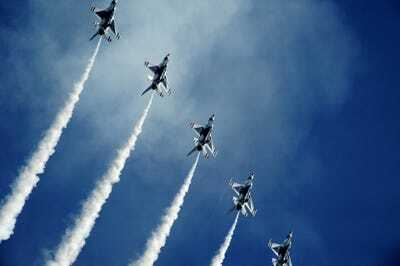 The Thunderbirds perform a manoeuvre for the audience attending the Team Andersen Air Show '09 'Air Power over the Marianas' on Andersen Air Force Base in Guam. 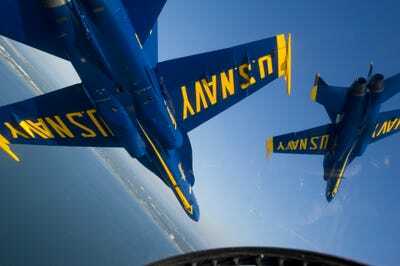 The Blue Angels, demonstrate choreographed flight skills during the annual Joint Service Open House. 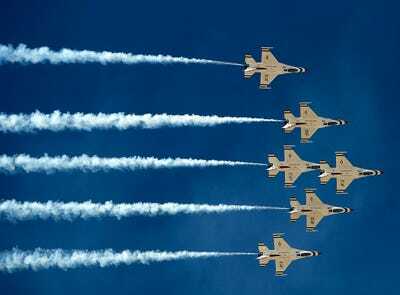 Four US Air Force Thunderbird F-16 Fighting Falcons zoom by the visitors of the Lightning in the Desert Air Show March 16, 2014. 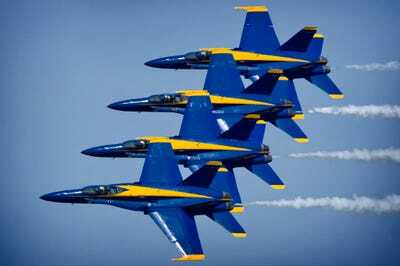 The Blue Angels lead the diamond in the Echelon Parade during a performance at the Rhode Island National Guard Open House Air Show. 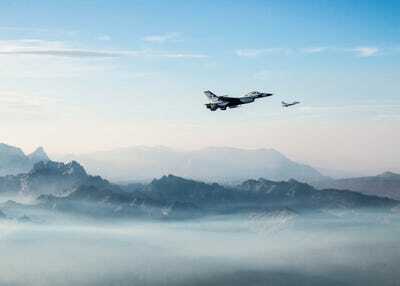 F-16 Fighting Falcons with the U.S. Air Force Aerial Demonstration Squadron Thunderbirds perform a 5-ship formation after refuelling from a KC-135 Stratotanker assigned to the 92nd Air Refuelling Wing over Glacier National Park, Montana. 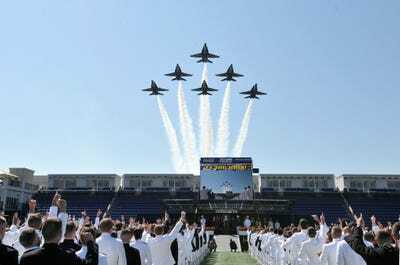 The Blue Angels, perform a flyover during a graduation and commissioning ceremony for the Naval Academy Class of 2015. 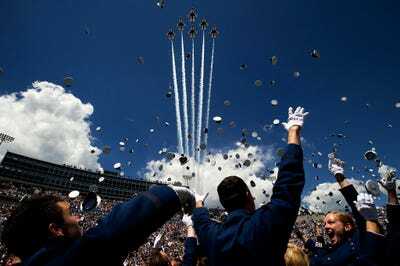 The Thunderbirds fly the Delta formation May 28, 2014, over Falcon Stadium during the US Air Force Academy graduation ceremony. Cmdr. 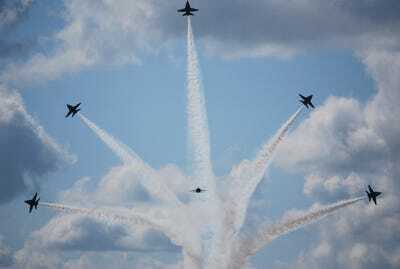 Dave Koss, flight leader of the US Navy flight demonstration squadron, the Blue Angels, calls for smoke before take off at the Sun 'N Fun Air Show as part of the 2011 show season. 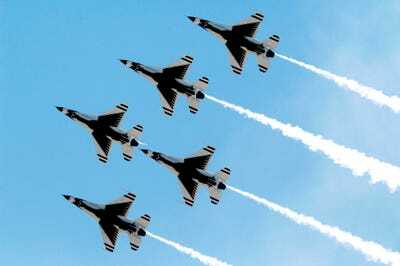 The US Air Force Thunderbirds precision-flying demonstration team flies in formation April 13, 2014, during the Thunder and Lightning over Arizona event at Davis-Monthan Air Force Base, Ariz.
F-16 Fighting Falcon aircraft with the Thunderbirds, the US Air Force aerial demonstration team, perform during the 2011 Legacy of Liberty Air Show on Oct. 8, 2011, at Holloman Air Force Base, N.M. 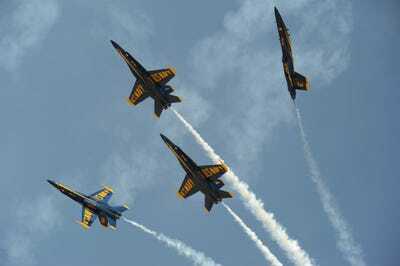 The Blue Angels perform a Diamond 360 at the Rhode Island National Guard Open House Air Show. 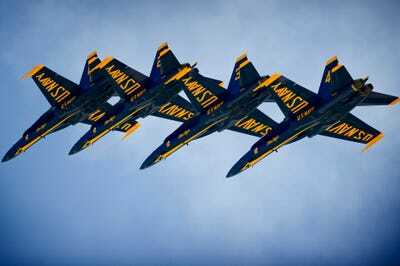 Pilots assigned to the US Navy flight demonstration squadron, the Blue Angels, join their F/A-18 Hornet strike fighter over the Gulf of Mexico into the diamond formation while approaching Naval Air Station Pensacola. 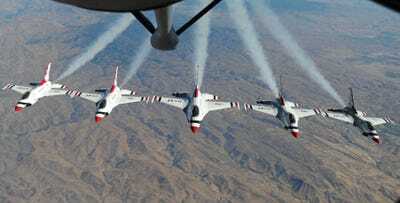 Maj. Jason Curtis, Thunderbird 5, and Capt. 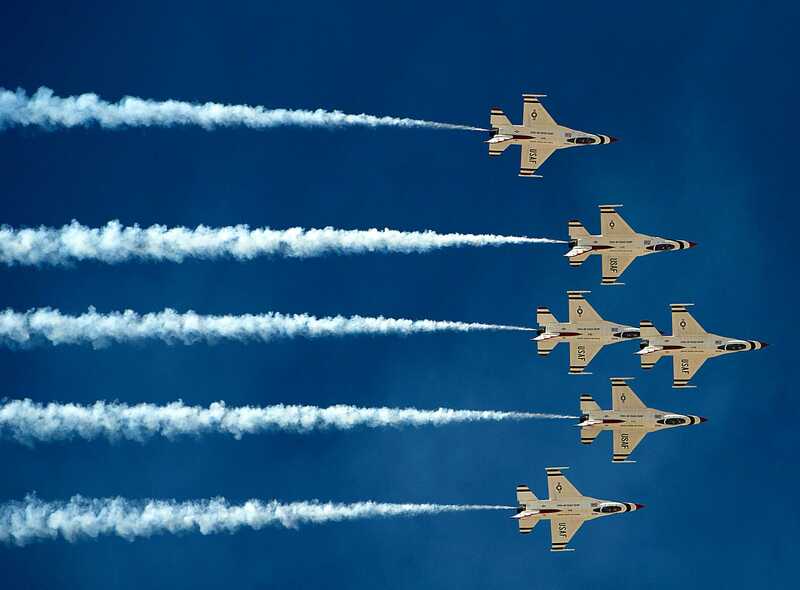 Nicholas Eberling, Thunderbird 6, fly back from Minden, Nev., Aug. 25, 2015. 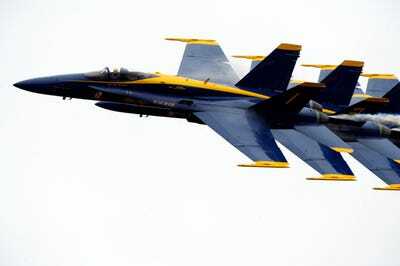 The Blue Angels, perform a breakaway manoeuvre at the Fargo AirSho during Fargo Navy Week, one of 21 Navy weeks across America in 2011. 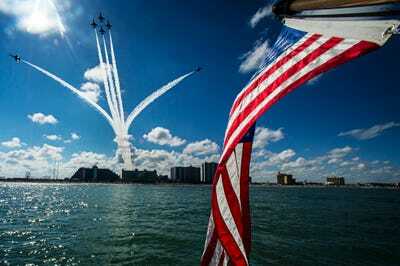 The Thunderbirds perform the 'Delta Opener' during the Wings and Waves Air Show Oct. 12, 2014, at Daytona Beach, Fla.